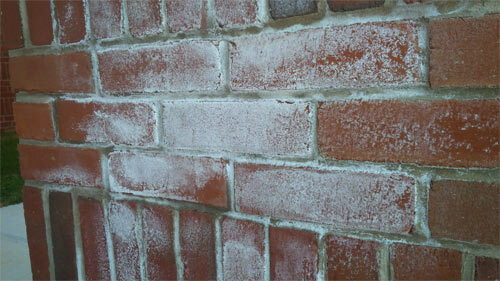 Efflorescence is a common problem in concrete and masonry block foundations. The white fuzzy stuff you see along the inside and outside of your basement wall is efflorescence. Don't worry this annoying build up isn't hazardous; efflorescence is simply salt and can be easily removed with efflorescence removers and other cleaning techniques. More than anything, if you see efflorescence it means you have a moisture problem and if gone untreated can cause deterioration. Efflorescence are minerals that are being carried by moisture to the surface and an indication of excess moisture issues. What happens is, water infiltrates the block or the concrete wall and dissolves minerals. As water evaporates from the surface of the unit the mineral deposits are left behind, thus efflorescence crystals can grow. Although efflorescence is generally a visual problem, if the efflorescence crystals grow inside the surface of the unit, it can cause spalling, which is when the surface peels, pops out or flakes off. The salt pushes from the inside out and can eventually cause crumbling and deterioration. If the efflorescence is removed, but then returns, it is a sign that water is entering the wall and driving the salts out. If it does not return, then the cause was initial moisture and salts from when the concrete was placed. First: There must be water-soluble salts present somewhere in the wall. 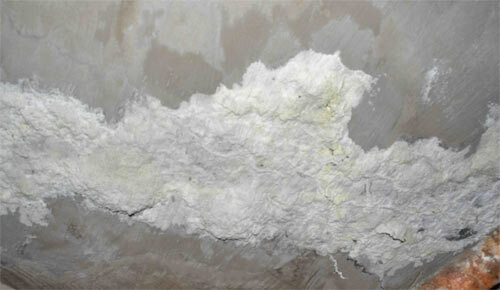 Second: There must be sufficient moisture in the wall to render the salts into a soluble solution. Third: There must be a path for the soluble salts to migrate through to the surface where the moisture can evaporate, thus depositing the salts which then crystallize and cause efflorescence. All three conditions must exist. If any one of these conditions is not present, then efflorescence cannot occur. The best way to prevent the problem is to prevent water from infiltrating the wall. If you see efflorescence crystals it usually means there is a leak somewhere letting outside water in. Once, the source of the water infiltration has been located and stopped then the walls can be cleaned with an efflorescence remover. While inside systems can divert the water, it may not solve the problem of efflorescence and other moisture-related mineral build-ups. Regardless of what is done on the inside, water is still entering through the wall from the outside. The salt that ends up as efflorescence crystals on your walls, can come from salt laden soils or the Portland cement in the mortar and grout. The soluble salts could come from the sand or from contaminated water used to make the concrete, grout or mortar. Another culprit is, of course, the clay brick itself. The natural clays used in the manufacture of brick often contain soluble alkali sulfates. Most modern fired clay brick have balanced chemical additives to immobilize the sulfates and render them insoluble. This prevents the salts from being dissolved into a solution that could migrate through the wall to the surface. Most fired clay brick do not greatly contribute towards the efflorescence problem. Although not dangerous in terms of health, efflorescence is a warning sign of danger to structural integrity. The traditional method of cleaning efflorescence has been sandblasting, which, of course, works. Unfortunately it removes just about everything else, too. The abrasive action of the sand erodes the surface of the brick and the tooled mortar joints along with any deposited salts. This increases the porous qualities of the masonry and the water absorptive nature of the wall. Sandblasting should be used with caution and afterwards the masonry should be sealed with a waterproofing material. An alternative to sandblasting, which has shown good success when done properly is the use of special chemical cleaners. Generally, thorough presoaking and post washing with clean potable water is required. Presoaking is done to saturate the wall, reducing its natural porous tendencies and limiting the depth of penetration of the cleaning solution. After the cleaning solution has been used, the wall must be thoroughly washed with clean water to remove any of the cleaning chemicals. This is very important since most cleaning agents are acidic in nature and cannot be permitted to remain in the wall where they will continue to react with and erode the masonry itself. A conventional chemical cleaner that has been used for removing efflorescence is muriatic acid in a mild solution, usually one part muriatic acid (hydrochloric acid, HC1) to 12 parts water. Several mild individual applications are better than one overpowering dose. Again, care must be taken to thoroughly presoak the wall with clean water and to thoroughly flush the wall of all remaining acids with clean water. Remember, cleaning efflorescence from masonry walls does not cure the problem; it only removes the symptoms. After cleaning, the efflorescence will reappear unless the natural efflorescent chain is broken. The presence of efflorescence shows that the salts are already in the wall, have sufficient water to be made soluble, and that migratory paths exist for the salt solution to travel through to the surface. Efflorescence is a controllable condition that should not be a problem in modern masonry. Breaking the chain of conditions necessary for efflorescence can be done with good details, the correct materials and quality construction. Tip #173. What are the most important factors in considering basement flooring choices? Natural properties of basement living space varies greatly from the rest of the home. Water vapor penetration through the cement slab-on-grade flooring can damage materials that have little resistance to mold growth, warping, cupping, peeling, etcetera. Taking all possible preventive measures will assist with seepage concerns, but there is no guarantee regarding catastrophic flooding.